Seeking ways plastic closure of defect of the wall of the stomach and 12 duodenal ulcer studied in many experimental and clinical studies. As plastic materials proposed omentum, omentum, fortified with other plastic materials, a flap of skin taken from the same organ in the neighborhood, synthetic materials. The study was performed to examine the possibility of plastic replacement of defects of the resected stomach wall stretch of the jejunum on a vascular pedicle, the factors of aggression and sewn, blood supply, innervation, macro – and microscopic changes sewn part of the colon. The experiment was conducted in 76 dogs. The operation consisted in the formation of small bowel transplant on a vascular pedicle, the cut on his protivovirucnam the edge and sewing defect in resected gastric wall. The area of the intestine with a length of 10-20 cm was taken at a distance of about 20-30 cm from the ligament of Trace and sewn in the pyloric or the cardia of the stomach, in the region of the greater or lesser curvature. The timing of clinical follow-up ranged up to 6 years. The experiments were divided into three serial groups: the first group (30 dogs) the operation was carried out in the normal blood supply, the second (14) — blood supply is disrupted by ligation of the vascular pedicle at different times after the operation (1 to 30 days) and in the third series (32) closure of defects of the gastric wall was performed in peritonitis, that is, at different times since the formation of the defect. Restoration of continuity of bodies was carried out by a single-core, two-and three-row seams of hygroscopic and gigroskopicheskii yarns, including suture-glue connection. 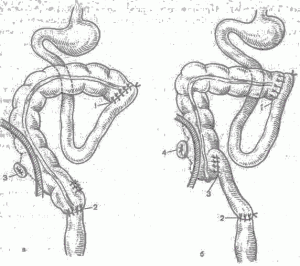 The study of the secretory function of the stomach and a sewn-in area of the intestine was performed using the developed methods — accelerated method of education Pavlovsky ventricle and excretion of skin graft in the wound of abdominal wall with subsequent determination of acidity and pH of gastric juice and detachable mucosa area of the intestine.